After a very good Season 4 featherweight tourney, won by Patricio "Pitbull" Freire, Bellator quickly threw together another 145-pound tournament for the summer and it looks to be loaded. Ronnie Mann and Nazareno Malegarie opened up this tourney with dynamic victories at Bellator 46 in Hollywood, Fla.
Mann, a nasty striker, crushed Adam Schindler with a left and knocked him out on the ground at 4:14 of the first while Malegarie (pictured) rolled through a variety of submission attempts and finally made good on a guillotine choke at 1:25 of the third. Both fighters advance to the semifinals. As long as they came out of their fights unscathed they'll be fighting on July 22 at Bellator 47 in Canada. Mann's a pretty accomplished fighter on the international scene and it showed against the American Schindler. Born in Thailand, Mann, 24, grew up in England. Before this dominant win, he'd made a name for himself in both Japan's Sengoku and several British promotions. Schindler, a former high school wrestling star and U.S. Air Force vet, chose to stand and bang with Mann. It turned out to be an awful gameplan. Just 20 seconds into the fight, Schindler actually rocked Mann with a nice combination. Mann (20-2-1) has too much experience to freak out and came back seconds later with a three-punch combo that stopped Schindler in his place. It got worse from there. Schindler would close space and throw hard shots, but nothing really landed. Meanwhile, Mann, still in pocket, blasted away with straight punches. With 55 seconds left in the first round, Schindler was dropped by a beautiful left hook. He fell to his back and got crushed by a right hand as Mann pounced. "The Ninja Kid" then got off eight vicious hammer fists before referee Jorge Alonso stepped in. Schindler was out cold. "I knew he was going to come in wild so I wanted come straight down the middle. So yeah it worked," Mann told MTV2's Jimmy Smith. "All I heard was my cornerman [Shawn Tompkins saying], 'use that left hook!' So I threw it and caught him." Malegarie was just as dominant, but used his jiu-jitsu game and improved wrestling to wear down Jacob Devree. The Argentinian training out of Brazil got the fight to the floor whenever he wanted. He worked for a guillotine submission for over a minute early in the first round. In the second, Devree fought off another early guillotine attempt and then survived the mount position from Malegarie. He was still alive entering the third, but all that submission defense wore him out. Just 25 seconds into the final round, Malegarie scored an easy takedown. Then Devree finally got sloppy with his defense. He pushed Malegarie off to create some space, but left his head exposed. That's death against a Brazliian jiu-jitsu black belt. Malegarie landed another guillotine choke and flipped so he was on top. Devree tapped inside of five seconds. Malegarie, 25, moved to 20-1. "This is the real Nazareno Malegarie that you've seen tonight," the winner told Smith. He's probably right. 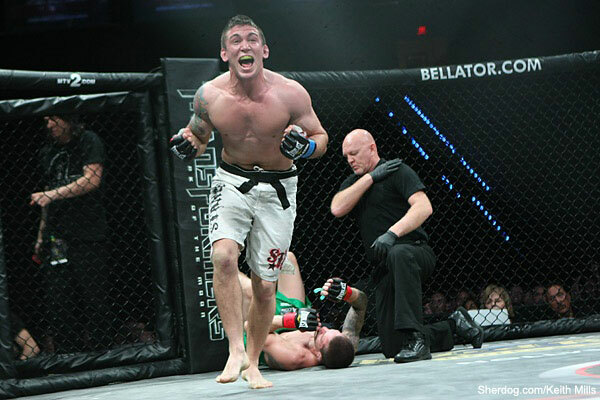 Malegarie lost to Daniel Straus in the first round of the Bellator Season 4 tournament. Straus, a huge featherweight, went on to the final and lost going the distance with very highly-touted Pitbull.